Today, Mollie infuses farm-fresh flavors into Old Dog Ranch’s walnut snacks, walnut butters, and hot pepper sauces, now available at the Ferry Plaza Farmers Market on Saturdays. 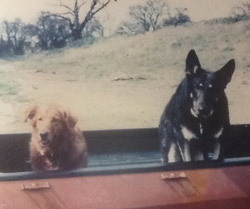 Old Dog Ranch, named for the Sitkin family’s two long-lived canine companions (Mollie Dog and Poppy), is located in Linden in the San Joaquin Valley. 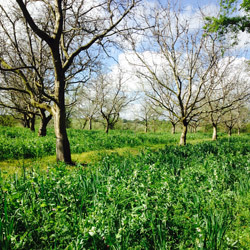 The land has seen many transformations since Mollie’s great-great grandfather purchased it in 1912. Mollie’s father, Roger Sitkin, grows Chandler walnuts, a cultivar prized for its flavor, golden color, and abundant yield. The trees are highly disease resistant, requiring less pest management. For Old Dog’s smoked paprika and garlic walnuts, the peppers are grown on site and smoked with walnut prunings. Honey for walnut butters comes from a Bay Area beekeeper, and the ranch will soon have its own hives. “Part of our five-year plan is to grow as much as possible on our ranch,” says Mollie. In 2012, she started growing specialty peppers to diversify the farm’s offerings. Old Dog Ranch also offers farm-fermented hot sauces, made from 30 varieties of peppers Mollie planted last year. For ingredients not grown on the farm, Mollie supports other local food producers. She sources organic rosemary from a first-generation farmer near Sacramento and buys cocoa from the family-owned Guittard Chocolate Company in Burlingame. 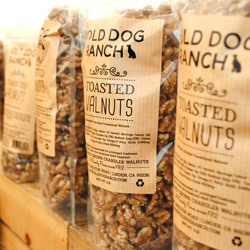 At Old Dog Ranch’s Ferry Plaza Farmers Market stand, you can expect to find raw walnuts—in the shell or ready to eat—plus just-sweet-enough treats like cinnamon-laced Mexican hot chocolate walnuts and savory nuts toasted with rosemary and black pepper. Look for Old Dog Ranch on Saturdays in the back plaza. Dog and orchard photos courtesy of Old Dog Ranch.